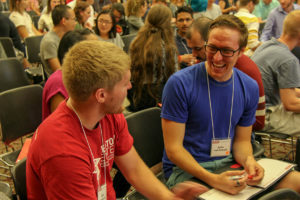 Two years ago, when the Graduate School planned its first teaching assistants’ workshop for the Friday before fall classes, about 50 students registered. And the workshop organizers were pleased and a little surprised when 100 actually showed up. Then in 2017 and again this year, more than 400 students signed up in advance for the day-long workshop that brings representatives from across campus to share their resources with soon-to-be graduate teaching assistants. Workshop organizer and Graduate School instructor Vanessa Doriott Anderson said she’s excited with enrollment growth for the workshop, which is approaching capacity. The whole group takes up half of one of the largest rooms at McKimmon Center, and smaller rooms are used for afternoon breakout sessions. The workshop is designed to help raise the confidence level of new TAs, Doriott Anderson said. They also learn about best practices in teaching and learning. 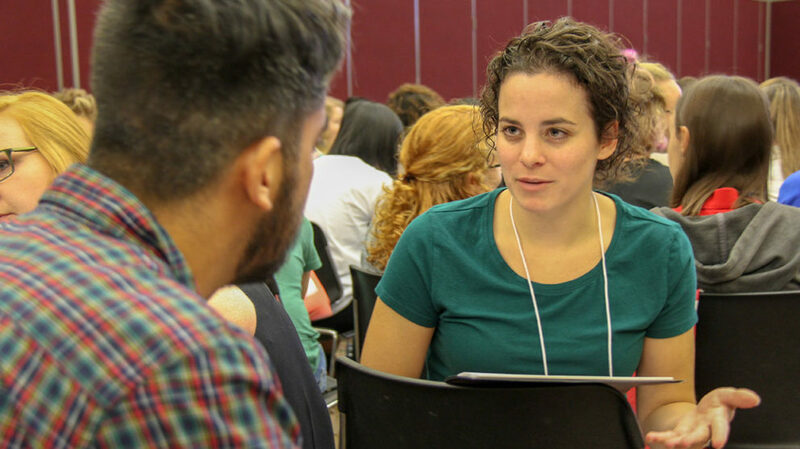 By bringing in partner organizations from across campus, the workshop introduces TAs to resources they might turn to for support down the road. The morning sessions included presentations on the Family Educational Rights and Privacy Act (FERPA), campus resources for student success, active learning strategies and communicating with students. Afternoon breakout sessions included two different panels of experienced graduate student TAs – one panel representing science and engineering and the other representing humanities and social sciences. Other afternoon sessions focused on teaching a science lab, grading and evaluation, time management, creating inclusive environments, teaching for international students, Libraries support and more. While the workshop is designed for new teaching assistants – most of whom are new to graduate school – there is space for returning TAs who want a little more training. Some NC State departments require their TAs to participate in the workshop, but even students who were required to attend seemed glad to be there. Bethany Showers, a graduate student in English, rhetoric and composition, will be teaching English 101 with a professor this spring and on her own a year from now. She came to the workshop to “get a better understanding of what I’ll be expected to do as a TA,” she said. Showers, who aspires to be a professor one day, said that Graduate School Interim Dean Peter Harries’ presentation on how teach effectively was helpful. She said she needs to learn more about grading and evaluation, as she prepares to grade freshman English papers. For her spring teaching experience, Showers said she looks forward to, “helping someone understand something new. I like reading, and I did a lot of writing help as an undergraduate. I’m looking forward to teaching people to improve their communication skills,” she said. James Lichty, a new Ph.D. student in chemical engineering, will also be teaching in the spring. Though his department requires TAs to attend the workshop, Lichty said he came because he has never had experience as a TA before. He found information about FERPA, which protects student privacy, to be helpful, as well as tips on teaching methods. He is concerned about classroom management and about answering students’ questions when he begins teaching in the spring. Darien Dixon, a sociology Ph.D. student, also said the information on FERPA was helpful. Though he knew about FERPA rules from a student’s perspective, he hadn’t considered how the act would be impact a university instructor. Though he won’t teach a class until spring, he was anxious to start learning how to be a TA. “Coming in to a new school, I’m taking advantage of any and every opportunity for learning — networking, workshops, lectures,” Dixon said. Dixon said he also learned there is a campus dentist office at NC State and got some tips on how to gauge students’ assumptions about class and what they already know. Shahida Afrin, a master’s student in textile and apparel management, said she will be a TA this semester at the Center for Technology and Innovation, working mostly with undergraduates. “I’ve never been a TA before, and I want to be a good TA,” she said. Among this year’s workshop partners were the General Counsel’s Office, Division of Academic and Student Affairs, DELTA, Office of Inclusion, Equity and Diversity; Office of International Services, College of Engineering, College of Education, College of Sciences and NCSU Libraries.